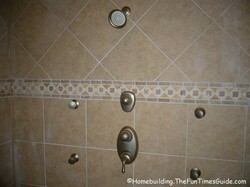 Here’s a “hot” bathroom trend. I’m starting to see more and more homes being built with luxury master bathroom suites equipped with custom shower systems. 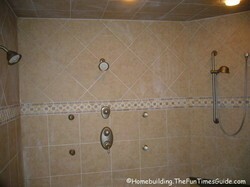 Builders know that nice kitchens and bathrooms sell homes. A HUGE custom shower room…yes…shower room surely would have a big WOW affect on potential home buyers. We happened upon a custom home with a shower room system equipped with multiple shower heads in the master retreat. Is this shower room overkill? You decide. In today’s sluggish home buying market, builder’s are looking for anything that will give their products an edge over the builder down the street. We came across this particular model home (for a new subdivision) a few months ago and I do believe my jaw dropped when I walked into the master bathroom and saw this shower room. I’ve never, ever seen one like it and haven’t seen one since. It is, indeed, spa-like with multiple-shower heads and multiple shower “stations” for lack of a better term. There were 3 stations in all in one fully-tiled shower room. It borders on excessive…check that…it exceeds it! There’s a tiled bench that can be of assistance for the elderly or disabled, equipped with a hand-held shower head, but I’m thinking it’s probably designed with women in mind so that they are able to sit down and shave their legs. Makes $en$e to me. Anyway you look at it, there’s a lot of square footage to keep clean. If you’re considering putting in a custom multiple-head shower, you need a planning guide to help you with all of the necessary upgrades such as ventilation for the huge amount of humidity that all of the shower heads will produce. You must consider proper drainage, a bank of hot water to tap into, water pressure and many other upgrades from a simple shower. The home that this shower room is in has two 50-gallon electric water heater tanks to draw from. That should keep an ample supply of hot water ready and waiting. By the way, the home that this shower room is in is currently for sale and priced at $475K. I’ve seen many homes priced much higher that can’t compare to quite the bathing experience that you’d find here. I’ve got a feeling that I’ll be seeing more master bathrooms like this one in the near future. Even hotels are catching on with multiple showerhead options.